Partnership. It’s the new buzzword. But what does it actually mean? The concept is simple; shared ownership brings shared benefits. For employers this means collaborating with other businesses in their supply chains, colleges, universities or even training providers to develop the skills they need. Sounds good in theory, but how does it work it practice? And what are the opportunities and challenges for this way of working? 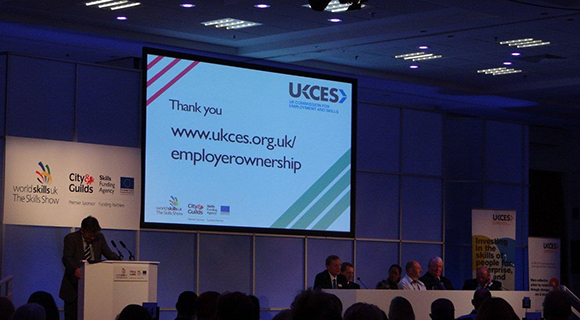 The UKCES –OECD Employer Ownership Workshop at the Skills Show set out to answer these questions and more. In doing so, the workshop embodied the concept it set out to promote, with a captive audience of employers, practitioners and policy makers in the skills system sharing their own perspectives, and working together to find a way forward. And with endorsement from Skills minister, Matthew Hancock MP and presentations from employers, it was easy to see the benefits of collaboration. At the heart of employer ownership is the agreement that employers must be given the space to step up and take responsibility for meeting their skills needs. After all, they are best placed to know what the issues are and how best to tackle them. But what was also clear to me is that employers are competing in the same space, in terms of facing similar kinds of skills issues. This includes the need to keep up with technological changes, strong management skills, and the challenges faced by an ageing workforce and rising youth unemployment. So why not turn this into an opportunity to work together to overcome these issues? Jaguar Land Rover did exactly this. Jose Lopés, head of technical excellence, explained that they faced a lack of technical skills in the long-term. Concerned that this would have an impact on their future development and business strategy, they formed a partnership with key universities. As a result, this collaboration has led to a Technical Accreditation Scheme (TAS) which today has generated 250 engineering graduates and 61 higher level apprentices. Not only are they accredited, they are equipped with relevant skills for the workplace that can help meet future demand. Learning from this model, SEMTA has received funding via UKCES Investment Funds to develop an advanced TAS to support growth in the Engineering Sector, and increase the supply of goods manufactured and sourced in the UK. So where do the challenges lie in this approach? Marion Fϋrbath, at the global financial service provider Credit Suisse, explained that through working in partnership they have trained over 700 banking and information technology apprentices; but this was no easy feat. Working collaboratively requires hard work to keep all partners motivated. Similarly, there were other issues such as having a good number of placements available, being able to deliver high-quality training and managing the timings of their placement programmes. However, working in partnership allowed responsibility for these issues to be shared, along with a set of shared expertise and resources to overcome them. But where does this leave individual ownership? A shared approach won’t be for everyone of course, but for many it can help to share the burden of training costs and witness real growth in their sector or business area. For small businesses in particular, it’s hard to think strategically when survival is what matters and costs are rising. But figures from the UKCES show that firms that do not train are twice as likely to fail compared to those that do not. So this is where collaboration and namely the employer ownership pilots can make a difference. To sum up in the words of Deborah Roseveare from the OECD, ‘we’re all in this together and we have to work on this together.’ In light of the difficult economic conditions making it hard for many businesses to develop and remain competitive, collaboration is a sustainable way forward. As I said at the beginning, the concept is simple and the results can be impressive. Isn’t it time partnership was more than just a buzzword? This was a very inspiring UKCES workshop. It was great to learn more about education and employer partnerships that are leading-edge and investing in talent and inspiring individuals to develop their capabilities and skills. I was particularly pleased to hear Dave Prentice talk about the need for high performing careers services that support individuals and employers to improve their understanding of labour market supply and demand requirements. The world of work is changing rapidly and building partnerships to maximise human talent and resources is the best way forward.